Former England and Ireland coach Mike Ford has joined Leicester Tigers' coaching team as they bid to avoid relegation from the Premiership. Ford will be a senior coach at Welford Road, initially on a deal until the end of the season. Leicester are 10th in the table, five points above bottom-placed Newcastle Falcons with five matches to go. The Tigers host Exeter Chiefs next Saturday before a potentially crucial trip to face Newcastle on 12 April. A former rugby league international, Ford has had spells as defence coach with both the England and Ireland rugby union sides, as well as head coach roles at Saracens, Newcastle, Bath and French club Toulon. While in charge at The Rec, he guided Bath to the 2015 Premiership final and implemented an attractive style of rugby in a team that included his son George, the England fly-half, who is now at Leicester. 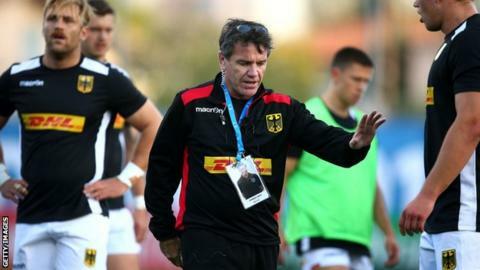 The 53-year-old Englishman recently took temporary charge of Germany as they narrowly missed out on qualification for the 2019 Rugby World Cup, while he also had a spell with American side Dallas prior to the Griffins' proposed move into Major League Rugby. Geordan Murphy will remain as Leicester head coach and retain control of team affairs, but Ford is being tasked with providing a clear gameplan for the under-achieving squad. Murphy told the club website: "I worked with him as a player when he was part of the coaching set-up with Ireland and he has a lot of experience at all levels of the game. His arrival should help ease the burden on Irishman Murphy, who had previously been responsible for technical coaching of the team's attack as well as head coach duties. Another of Ford's sons, fly-half Joe, is also part of the playing group at the Tigers, so the family combination will be pivotal in determining whether Leicester avoid relegation for the first time.